Solgar Full Spectrum Omega Wild Alaskan Salmon Oil Softgels are carefully manufactured from Wild Alaskan Salmon that were sustainably caught from the pristine, cold waters of Alaska. These softgels go through a purification process to ensure removal of heavy metals, including mercury, while still maintaining optimal integrity of the oil and potency. Fish have few peers on the list of healthful foods. Although most fatty, cold-water fish are natural sources of Omega-3, one of the most beneficial sources is Wild Alaskan Sockeye Salmon, making it unique among high-protein foods. Its natural oil is among the purest of all ocean fish. 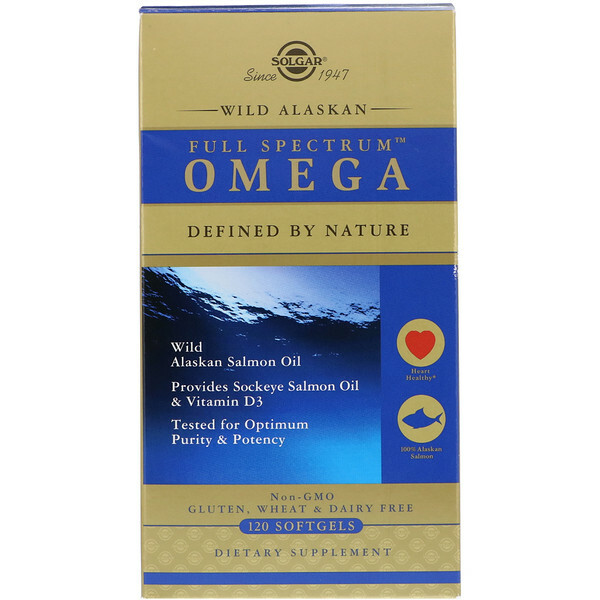 Wild Alaskan Sockeye Salmon is also one of the premium sources of EPA and DHA—the Omega-3 fatty acids that most people consume too little of, and that make this fish uniquely healthful. 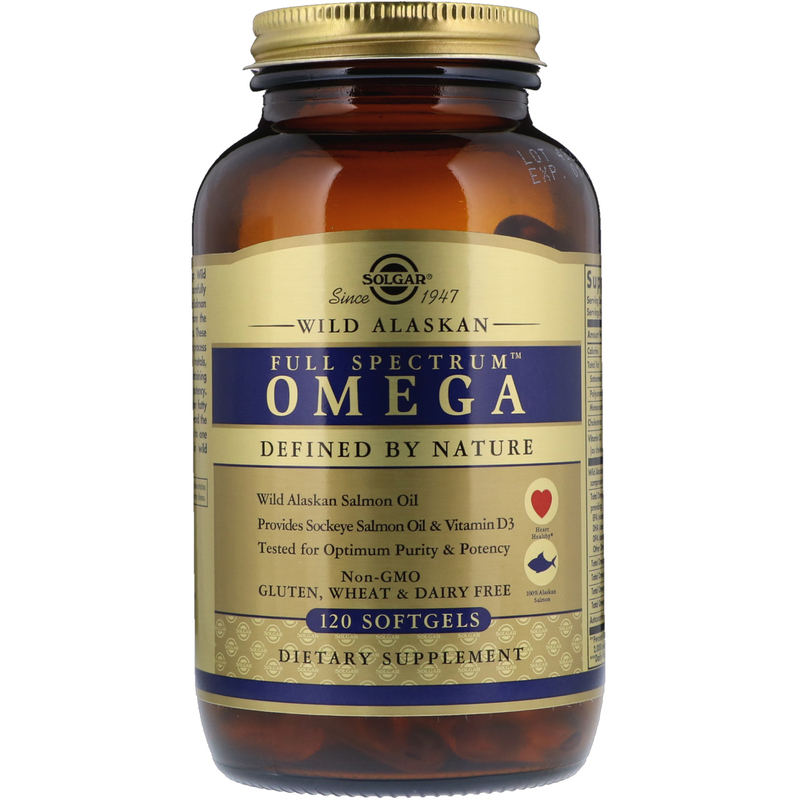 The levels of EPA, DHA, and other fatty acids found in Solgar's softgels—and the proportions of each in relation to one another—reflect those found in wild salmon. Solgar's Full Spectrum Softgels provide an excellent source of Vitamin D3, an essential vitamin that supports many areas of wellness, including, bone and immune health. 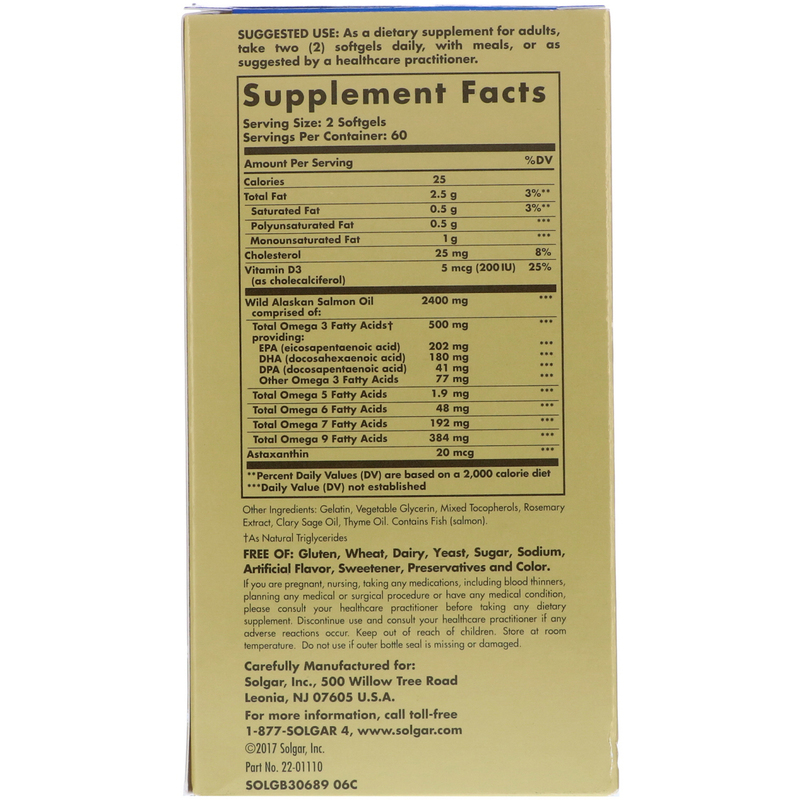 As a dietary supplement for adults, take two (2) softgels daily, with meals, or as suggested by a healthcare practitioner. Gelatin, vegetable glycerin, mixed tocopherols, rosemary extract, clary sage oil, thyme oil. Contains fish (salmon). If you are pregnant, nursing, taking any medications, including blood thinners, planning any medical or surgical procedure or have any medical condition, please consult your healthcare practitioner before taking any dietary supplement. Discontinue use and consult your healthcare practitioner if any adverse reactions occur. Keep out of reach of children. Store at room temperature. Do not use if outer bottle seal is missing or damaged.